50 years after the march 1961 Geneva Auto show launch, the Jaguar E-Type (or Jaguar XKE in the US) is more beautiful than ever. My first contact with this car was when I was twenty, it was a roadster version parked just in front of my engineering school. No doubt I would be able to buy one after some time… but that never happened : the car began to be far too much expensive when I started to get some money to put on it. But that’s the way it usually happens, and it’s just good to make you dream about it and want to buy one when you are really older. To come back on this car, probably you have seen plenty of presentations here and there about it, so let’s have a look on the life that goes with it. For 10 – 20 k€, this car is not exactly a car for picnics, but it is pretty versatile to allow that. That one that I’ve shoot at Le Mans Classic is full of bread and french wine. 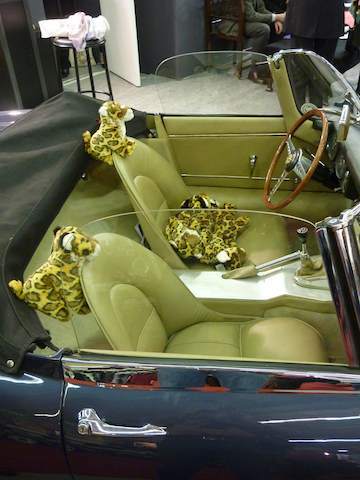 But it’s an old Jaguar too, so you’d better make sure she’s getting something to drink. 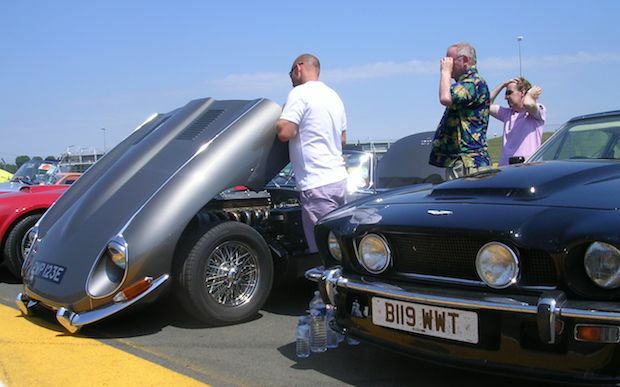 See how this one is thirsty and make its drivers nervous… (look at the bottles near the Aston). 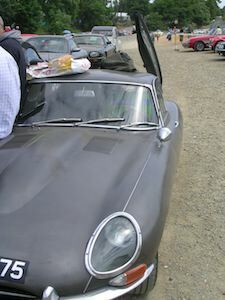 This is obviously the Jaguar E-Type Lightweight Low Drag Coupe. It kept the steel chassis but used an aluminium body and cylinder block. This helped cut the weight by over 200 kg, while the revised 3.8 litre engine was giving over 300 bhp. A first version was built by John Coombs in 1961/62 and the Jaguar factory used it as a prototype to build a total of 12 cars. Unfortunately it could never beat the Ferrari 250 GTOs in 1963, but it is still the most thought-after version. These lightweight versions are in the 3 M€ range today, but the ultimate and most unique “Lindner-Nöcker” version is even higher! I’ve not seen it yet since full reconstruction, but I’ve made a mashup with my videos of lightweight versions in action at Le Mans Classic 2010. Enjoy. 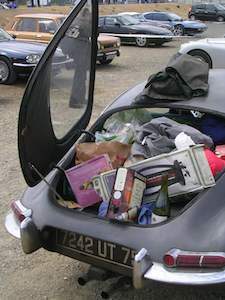 That was about me and the e type. But what about you, do you have any personal story about the big cat?